The Jabra BIZ 360 MS USB Duo is an UC headset for professionals. It combines true wideband sound and gives excellent audio quality with all the advantages of Duo speakers. The headset considerably enhances the user-experience and boosts productivity with UC solutions. This headset is for users in office environments who spend up to 3 hours a day on the phone. The BIZ 360 USB Duo UC has Duo speakers which make it perfectly suitable for a noisy office environment. The noise-canceling microphone effectively cuts off unwanted background noise. Its On-device call-controls lets you adjust volume, answer, end and mute calls directly from the headset. 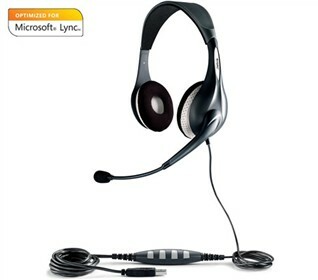 This BIZ 360 MS USB Duo Headset is Compatible With All Major UC Applications. The Jabra BIZ 360 MS USB Duo - Replaced by UC Voice 150 has many exciting features for users of all types. You can extend the lifetime of your Jabra BIZ 360 MS USB Duo - Replaced by UC Voice 150 with the purchase of a FactoryOutletStore Factory Protection Plan. See the Jabra BIZ 360 MS USB Duo - Replaced by UC Voice 150 gallery images above for more product views. The Jabra BIZ 360 MS USB Duo - Replaced by UC Voice 150 is sold as a Brand New Unopened Item.